Build one of today’s most popular benches. 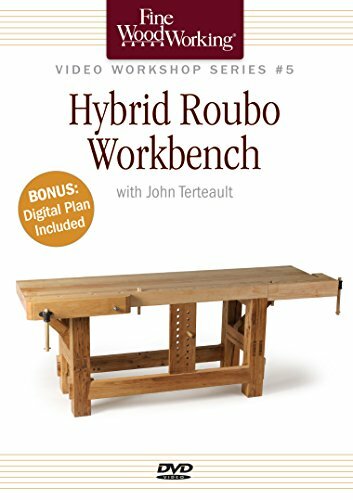 In under one hour, you can learn what it takes to build the iconic bench everyone wants to own with Build a Hybrid Roubo Workbench. Woodworker John Tetreault, who specializes in using reclaimed lumber, walks you through the entire project and offers expert guidance at critical steps on this DVD, that includes a Bonus SketchUp Plan. Master three styles of classic joinery. As you build this bench, you’ll also build your joinery skills since it involves making stopped tenons and wedged-through tenons. Plus you’ll also learn how to build a dovetailed tenon that incorporates a hardwood wedge; this is especially important if you plan to disassemble your bench in the future. Use recycled wood to best advantage. Love the look of aged timber? Then you’ll enjoy learning how John prepares recycled planks to make the joinery work with the checks, cracks, and worm holes that give these timbers their unique character. Craft your own unique accessories. Once you’ve built your bench, you can go on to construct your own maple bench dogs, vise handles, and a sliding deadman that’s great for supporting long stock. Don’t miss this chance to build a bench that will serve you well for years to come.